Former player Kerry Hardwell has been named manager of Rustington Football Club. 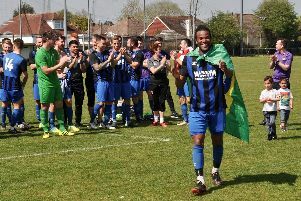 The 30-year-old takes charge of the Blues having guided Pagham Reserves to the Southern Combination League Reserve Section Cup crown in his first role in management last season. Hardwell will have his work cut out to better Rustington’s successes over the 2017/18 campaign. Under the guidance of Jon Tucker, who will be Hardwell’s assistant next season, Blues completed the double by winning both SCFL Division 2 and the Sussex Intermediate Cup. Hardwell is hungry to continue on from the club’s success next season. He said: “I’m very excited . After leaving Pagham, it was the next step for me in my coaching and management career and I know the club because I played there a few seasons ago so it was an easy option. Hardwell, who featured for Rustington, Wick and Nyetimber Pirates during his playing days, felt the offer to become Rustington manager was ‘too good to turn down’. Coming in on the back of a cup win of his own with Pagham Reserves, Hardwell is hopeful of replicating that as he takes on the challenge as manager of SCFL Division 2 outfit Blues. “It’s nice just to refresh. There’s nothing worse then becoming stale in a role and not having the same desire to win it again," Hardwell said. “I’ve been informed that the club has never won back-to-back league titles, so that’s the full motivation to do that. “I’ve spoke to the captain from last season Ryan (Hudson), Steve (Kirkham), Chris (Darwin) and Alex MacIver, they’ve all messaged me privately. Hardwell played under previous manager Tucker at both Wick and Rustington and is delighted the former boss will be sticking around as his assistant next season. “He’s (Jon Tucker) is vital for me,” Hardwell said. “I played for Jon for many seasons, he knows a lot about the county league, especially SCFL Division 2. Hardwell is confident of keeping last season's double-winning squad together and is on the lookout to bring in four or five new faces. Speaking on the style of football he’ll look to implement at Rustington, Hardwell said: “It’s going to be a mixture depending on who turns up at at training.